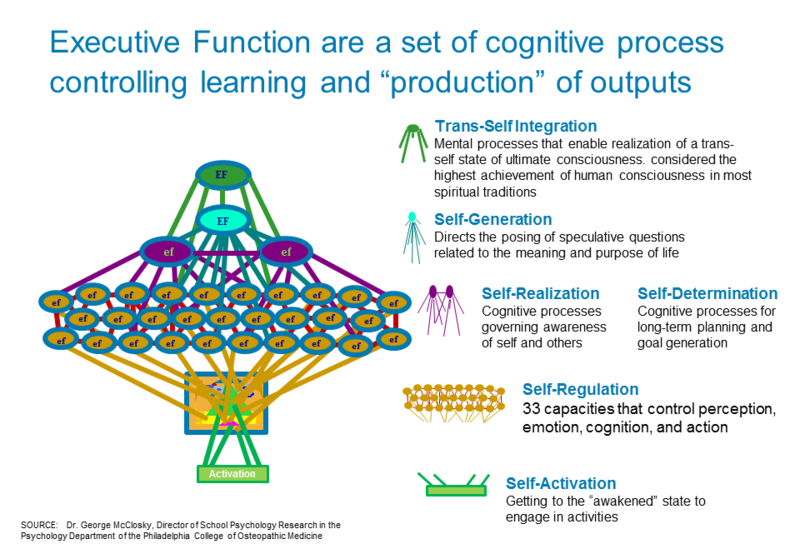 An overly simplistic description of Executive Functions (EFs) is that they are a set of cognitive processes responsible for cueing, directing, and coordinating one’s own perception, emotion, cognition, and action. Effective coordination and control of EFs allows one to take in and process information, plan actions and execute on those plans. Conversely, ineffective mastery of EFs result in behaviors that lead to difficulties in school and work environments. Self-Activation. Self-activation has to do with how executive functions wake up from sleep. It’s difficult to engage and function if the brain is still in a sleep state and not yet activated. Self-Regulation. Self-regulation comprise 33 executive functions (certainly a large number) that are involved in all that we perceive, feel, think and do nearly every waking moment of the day. Self-Realization and Self-Determination. The development of self-realization is the critical starting point to develop any meaningful sense of others. Persons diagnosed with Autism and Asperger’s are typically very deficient in the executive capacities related to the development of self-awareness, and consequently very deficient in the development of awareness of others. Self-determination involves those EFs that enable goal-setting and long-term planning. Self-Generation is the next tier of EFs involved in the inquiries into the nature of existence; the purpose of life; concept such as mind and soul; relationship between mind and body; and consideration of the possibility of the existence of God. Trans-Self Integration. Some individuals with advanced “frontal lobe activation” can engage EFs that see past the self and consider the “ultimate truth” of human existence. 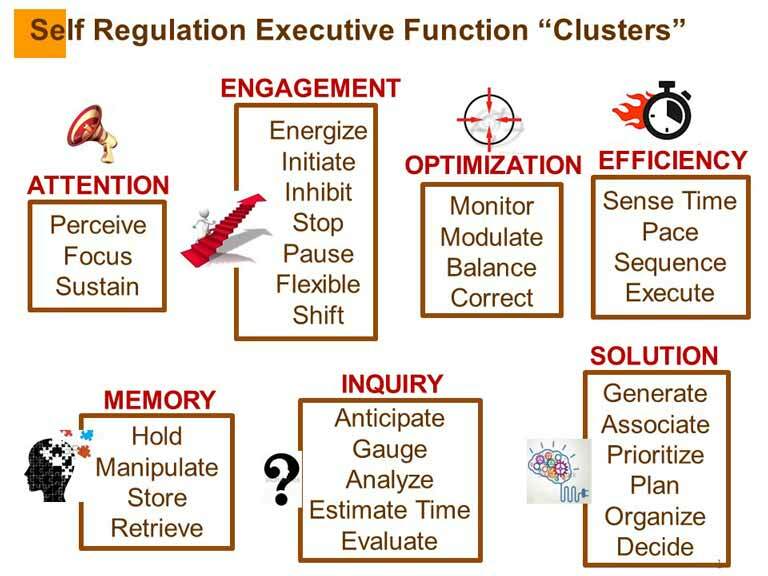 Our priority focus is Self-Regulation, within which the HMEF specifies 33 separate EFs that can be grouped into 7 clusters. To illustrate these EFs in a manner that parents and educators can relate to, the following discussion highlights problem behaviors likely to be exhibited in school settings by a student experiencing difficulties with self-regulation executive capacities. Understanding where a child stands on these EFs provides a starting point for where a child faces barriers and where additional help and support could be beneficial. Identifor aims to contribute to a better understanding of a child’s EF starting point, and over time help the child develop the deficient skills. Of course we cannot hope to assess all these Self-Regulation EFs through our games – not even when we’re much further along. We will, however, endeavor to use as much data from the various games to provide a glimpse into as many of these EFs as possible. Furthermore, we will enable the systematic use of the McCloskey Executive Function Survey (MEFS) to collect information about a child from parents, those people parents invite to provide feedback (e.g., educators, therapists, etc.) and even the child himself/herself if appropriate and possible. This 360° assessment of a child may provide valuable insights into areas of commonalities as well as areas of possible disconnects. At the heart of Identifor’s technology is GetAbby, an artificial intelligence platform that uses natural speech processing and a human avatar to enable players to have one-on-one conversations with Abby. Over time and as resources become available, we will train Abby to help players develop EF skills as all the research shows that EF skills are trainable. Since not everyone can work with Dr. McCloskey on a regular basis to build these EF skills, Abby hopes to provide a partial solution as Dr. McCloskey will train her to ask the questions he would ask, have the type of conversations he would have, etc. The aspiration is to make EF skill development much more accessible to any child who has a need.